Teaching Entrepreneurship moves entrepreneurship education from the traditional process view to a practice-based approach and advocates teaching entrepreneurship using a portfolio of practices, which includes play, empathy, creation, experimentation, and reflection. Together these practices help students develop the competency to think and act entrepreneurially in order to create, find, and exploit opportunities of all kinds in a continuously changing and uncertain world. Divided into two parts, the book is written for those educators who want their students to develop a bias for action and who are willing to explore new approaches in their own classrooms. A set of 42 exercises with detailed teaching notes is also included to help educators effectively teach the practices in their curriculum. 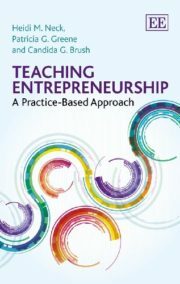 Entrepreneurship educators will find a great deal of useful knowledge in this volume, which provides relevant, targeted exercises for immediate application in the classroom.